Simon is a director and co-founder of Gameplanet. Gameplanet has been the hub of gaming in New Zealand for nearly 16 years. Maybe that’s a modest achievement in the grand scheme of the universe, but it is enough time for us to have seen significant changes in gaming, technology, and the world we live in. The site launched with the ambitious vision of offering everything we thought local gamers could want, in one place: an online “e-zine” with news and reviews, a player community with forums and events, and multiplayer servers for online games. 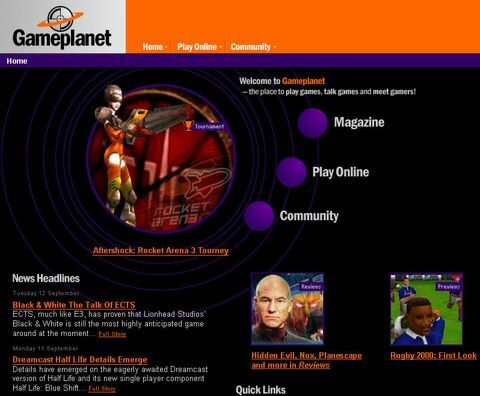 Gameplanet on launch day, 13 September 2000. You embraced the concept, and the Gameplanet community rapidly became the largest of its kind in New Zealand. Gameplanet has long enjoyed a leading position in the local games media, and on the international stage we punch well above our weight. That’s thanks to the hard work and professionalism of our writing team, and the dedication of our volunteers. But we are still a very small operation in a small market at the bottom of the world. The only person making close to a full-time living from the site is our (fabulous) editor, Matt Maguire. We have few resources but do a lot, I think, with what little we have. Like most media websites, we give away everything we produce for free and rely on advertisers to pay our bills. But recent shifts in the Internet landscape have made it harder for small publishers to survive under this model. Across the ditch, in the last seven months Australian games media sites MMGN and Games.on.net have both folded, and the past couple of years have been particularly brutal for Oceania gaming sites overall. Competition is at an all-time high, and the ad model is failing all but the largest content producers. At the end of last year, I realised that Gameplanet was not going to be able to continue on its current trajectory. Revenue was falling, and we had already cut costs to the bone. Something had to change, or we were going to crash. I reached out to my friend and Gameplanet co-founder, Simon Barton, for help. Simon is also the owner of online retail store Mighty Ape, and he proposed that Mighty Ape could rescue Gameplanet by making an investment in the business. After much deliberation, that’s what we’ve now done: Mighty Ape has acquired a 60 percent shareholding in Gameplanet, and will provide the support needed to save the day and get Gameplanet back on track. Gameplanet’s overall identity will not change as a result of this. We’ll still be all about quality content that’s well-written, reviews that are honest and reliable, and supporting our vibrant community of gamers. A renewed focus will be local events, and local content for our New Zealand readers. We want to create more of the kind of stories you can’t find elsewhere on the web. And our commitment to editorial integrity will remain unchallenged – Mighty Ape will have zero say regarding review scores, or the tone of any of our opinion pieces. This is in a sense a return to our roots. As well as starting Gameplanet with me back in the year 2000, Simon was at that time the owner of an independent game shop called GameZone. 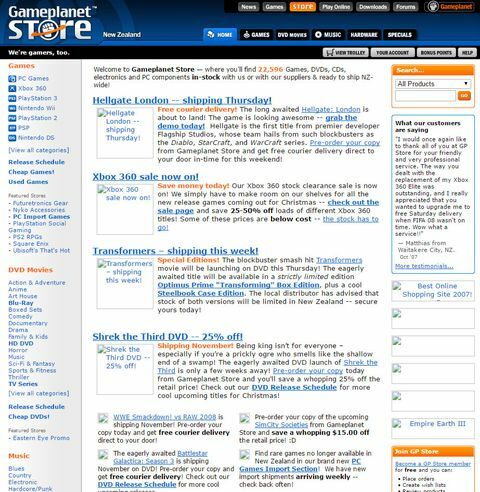 Between 2002 and 2007, that business became known as Gameplanet Store. Despite the shared brand, the store was always a separate entity, and operated independently from Gameplanet itself. However, it gave us a fourth proposition for gamers: a place to buy games, too. In 2008, Simon relaunched the store as Mighty Ape, with the aim of expanding beyond games. Today it is the largest e-commerce site in New Zealand, selling books, music, homewares, nappies, protein bars, toys, games, and a million other things in between. But Mighty Ape traces its history back to the the mid ‘90s – the days of GameZone, the Amiga, and a bunch of old-school gamers who wanted to provide a great service to other gamers. We aren’t winding the clock back; there won’t be another Gameplanet Store. But I do believe bringing Gameplanet and Mighty Ape together again will make us both stronger – by our powers combined. Most importantly, it will avoid (for now, at least), Gameplanet’s untimely demise. To those of you who have been with us a while: thank you so much for giving us your time and attention! Without you, Gameplanet wouldn’t be a thing at all, and we owe you a debt of gratitude. If you’re new to the site: welcome! We hope you find things here you enjoy, and may you return soon with dozens of friends and click all our ads until your fingers seize up. Whatever the case, cheers for supporting us and getting us this far, and we look forward to providing you with more quality content to read and comment on, as well as a place to hang, for many moons to come.